Arthur Theophilus Hill, known as Marshall, was born in Yeovil in 1893, the son of glover John William Hill (b1849) and Mary née White (b1852), both of Yeovil. Arthur had four older sisters; Dorcas (1871-1942), Amelia (b1879), Ada (b1882), Beatrice Georgina (b1885), an older brother Frank James (b1887) and a younger brother William. The family lived at 3 Reckleford Hill (see Gallery). In the 1901 census John was absent and Mary was listed as a glove liner, with her children Ada, Frank and Arthur. In the following 1911 census the family were at 4 Reckleford Hill (a re-numbering? ); John and Mary were listed with Beatrice, Frank and 18-year old Arthur. John gave his profession as a glove staker while Arthur was a staker's apprentice. 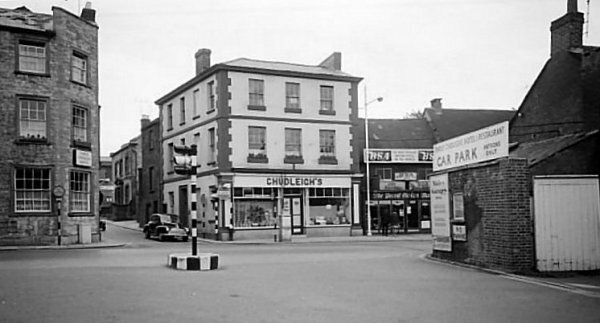 Whether he served out his apprenticeship or not is not known but Arthur, or Marshall as he was known, was known to work at Chudleigh's corn merchants on Hendford, on the junction with South Street (see Gallery). Marshall enlisted at Yeovil around Christmas 1915, joining 8th (Service) Battalion, Somerset Light Infantry. His Service Number was 20743. The 8th (Service) Battalion was formed at Taunton on 20 October 1914 and came under command of 63rd Brigade, 21st Division. The battalion went to France on 10 September 1915, landing at Le Havre and immediately became embroiled in the Battle of Loos. During the Battle of Loos, the 21st Division suffered over 3,800 casualties and took the rest of the year to rebuild. It was during this rebuilding that Marshall would have joined his battalion on the Western Front. From July to November 1916 the battalion took part in the Battles of the Somme. On 1 July Marshall was severely wounded in his leg and returned to England, spending some six weeks in a war hospital in Huddersfield. On release from hospital he enjoyed ten days home leave, followed by a few weeks of training before returning to France. On 8 July 1916 the battalion transferred with 63rd Brigade to 37th Division. The 8th Battalion, Somerset Light Infantry, next fought in the Battle of the Ancre from 13 to 18 November 1916. This was the final large British attack of the Battle of the Somme in 1916. It involved an attack on the German front line as it crossed the Ancre River, a sector of the front that had first been attacked on the first day of the Battle of the Somme without success. This was a strong sector of the German front. The first British objective involved an advance of 800 yards and would require the capture of at least three lines of trenches. The next target was the German second line, from Serre south to the Ancre. Finally it was hoped to capture Beaucourt, on the Ancre. All the early successes on the Ancre achieved was the creation of a British held salient on the Ancre, which proved to be a very dangerous area to be posted over the winter of 1916-17. Sadly Marshall was was killed in action on 14 November 1916, the second day of the Battle of the Ancre. He was aged just 23. In its edition of 15 December 1916 the Western Gazette reported "Official notification was received on Wednesday morning by Mr and Mrs J Hill, of Reckleford Hill, that their youngest son, Private Arthur Hill, of the Somerset Light Infantry was killed in action on the 14th of November. Accompanying the notification was a message of sympathy from the King and Queen. Private Hill, who was 23 year of age, had been in the Army about eleven months, being called up with one of the first Derby Groups. Private Hill was familiarly known as “Marshall,” and was formerly employed at Mr B Chudleigh’s corn stores, Hendford. He was of a very cheery disposition, and a keen footballer, playing in goal for several local teams. Private Hill was wounded on the first day of the “Big Push” (July 1st) in the leg, and was for about six weeks in a War Hospital at Huddersfield. On his recovery he received the usual ten days’ leave, and after a few weeks training, returned to France. Much sympathy is felt for the parents in their sad loss." Arthur 'Marshall' Hill is commemorated on Pier and Face 2A. 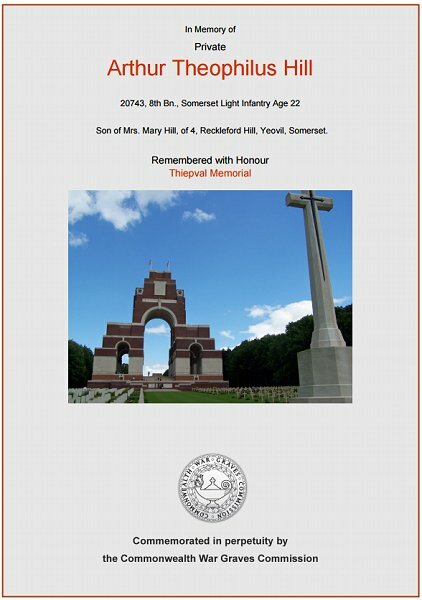 Thiepval Memorial, France, and his name is recorded on the War Memorial in the Borough. Cottages on Reckleford by Goldcroft, with the Nautilus Works at far right. The Hill family lived at No 3 (in the middle) at the turn of the century. Photographed in the early 1960s, these cottages were demolished soon after this photograph was taken. This photograph, probably taken in the 1960's, shows Chudleigh's Seed Merchants on Hendford where Marshall worked before enlisting. 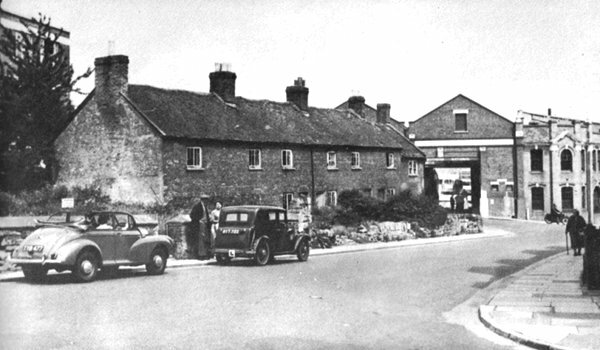 The Three Choughs Hotel is at left, with the car coming out of the narrow South Street.. Chudleigh's Seed Merchants was demolished in the 1960's to widen South Street. The Commonwealth War Graves Commission certificate in memory of Arthur 'Marshall' Hill.